All photographs or electronic scans remain the copyright @ of the Banstead History Research Group or the specific contributors and cannot be reproduced by either digital, electronic, electrostatic or lithographic or by any other means without expressed permission from the originator of the web site or its contributors. This new section is designed to hold memories of wartime Banstead and surrounding villages such as Nork,Woodmansterne, Burgh Heath, Tadworth and Kingswood. Also to be included are wartime stories from any residents living locally during the war years. Mail the Webmaster with any contributions. Thank you. NOTE - None of these stories have been previously published in any of our books. November 2009 - Dennis Skinner - Memories of the ARP in Banstead. February 2009 - Jane Smith - William Peasley in Home Guard group photograph. November 2008 - Richard Wilman - Wartime events from a Winkworth Road resident. July 2008 - Liz Christie and Judy Forth - The story of Pilot Officer Antony Hayward. June 2008 - Tom Slaughter - The Summer of 1944. Nov 2007 - Michael Woodman - Hillside, Nork, memories. The original memories were recorded by his father George Skinner. MY MEMORIES OF BANSTEAD ARP in WWII. 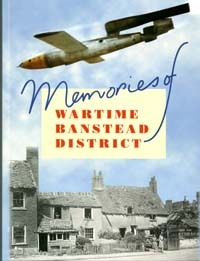 MY MEMORIES OF BANSTEAD IN WORLD WAR 2 . On the beach with my father Eric Wilman. 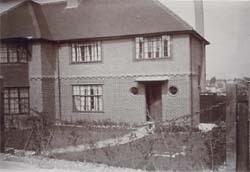 Our neighbours at 31 Winkworth Road, Mr and Mrs Peacock, who were also builders of our house and several others in Winkworth Road, owned a second home in Littlestone on Sea. We stayed there on holiday for 2 weeks, from Saturday 25th May to Saturday 8th June 1940, the stay covering the whole period of the evacuation. The house backed onto the beach and I can remember vividly looking out to sea daily and seeing the vast numbers of boats and ships at sea with a background of black smoke over the French coast. The vessel which really sticks in the memory was the large white ship with a large red cross on its side. The weather as I remember it was sunny. In my Father s records there are 2 photos of us which included my brother, then only two and a half months old, on the beach at Littlestone. I can also remember one night an air raid warning sounded during which time we had to stay under the stairs for protection, being the strongest part of the house. My Mother told me many years later that early every morning during our stay there my Father patrolled the beach to make sure there were no bodies present. None were ever found although he apparently found a lot of equipment.
. A number of times during the war I can recall pieces of shrapnel by this sandbag wall and holes in the hessian. At the start of the war whenever the air raid siren sounded ( sited on the police station on the High Street) we used to go into the cupboard under the stairs for protection, day or night. We had been told that the stair well is the strongest part of the house and the place most likely to withstand a bomb hit or blast on the house. I remember hating going into the cupboard because with the door pulled closed it was cramped, dark, hot and claustrophobic. The remains of the old Smithy shown on the right hand side of this photo. The building in the centre was Gilmours. 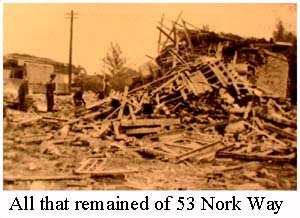 The V1 damaged buildings were quite extensive in Warren Road and also at the Nork Way shops. One shop badly damaged was Hookhams the grocers where my Mother did some of her shopping. 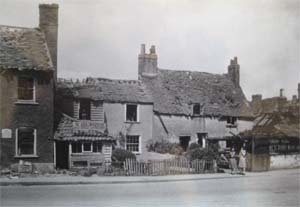 I remember also I believe with some disbelief the damage from the V1 which destroyed the Eastern end of Banstead High street and the loss of the old Smithy. Probably the most frightening experience was one morning when walking to school with one of my friends. Our school was Nork Primary School, now called Warren Mead Junior School. From Winkworth Road we would walk to the crossroads with the Brighton Road, crossover to Fir Tree Road and then cut across a piece of open land to Eastgate. From here we would go down the hill of Nork Way and at the bottom turn right into Warren Road. Towards the end of this road we turned left into Roundwood Way. This particular morning we had just turned right into Warren Road when the air raid sirens sounded, and, almost immediately we heard the familiar dreaded drone of the V1. We looked up and there it was, low and almost directly overhead, and then crashed and exploded a little further on.. We were petrified and ran into the nearest house, the house which was just on the corner, knocking wildly on the door. A lady let us in and phoned my mother who came and collected us and took us on to school. ( I later learnt that the lady was a Doctor). One day we observed a V1 overhead being chased by one of our fighter planes. It was using its wingtip to change the direction in which the doodlebug was heading. I accompanied my father one Saturday afternoon to my school. He had volunteered along with other fathers to help repair the school s windows, many of which had been damaged by a doodlebug landing and exploding near by. Later, we started to experience the arrival of the V2s, silent until the explosion. One landed relatively close, on or about the 22nd February 1945. We were having a birthday tea with some friends. Suddenly there was a massive explosion and everything rattled. We learnt later that it was a V2 which had hit the wall surrounding the Banstead Lunatic Asylum, located just east of Sutton Lane, Banstead Downs. I cannot remember when they were constructed, but as far back as I can remember the anti tank earthworks etc were in place at the crossroads of the Brighton Road, A217, and Winkworth Road and Firtree Road. They consisted of deep trenches dug either side of the A217, on the South side as far as the Police Phone Box on the west Side, and on the Northern side almost as far as railway bridge. To the East side of the trench backing onto the railway cutting a concrete blockhouse was constructed. (as far as I know never used by the army, but a great place for playing as children). On the 4 corners of the cross roads other anti tank protection was built, little pyramids of concrete and rail track bent into arches and the ends buried in concrete. Crossing the railway bridge and onto the northern side of Banstead Downs, there was a long straight grass track, as wide as a main road. At intervals along its length poles were erected in pairs, one each side, and cables stretched between the poles. These were I was told to prevent the use of this grass strip as a landing ground for German aircraft. 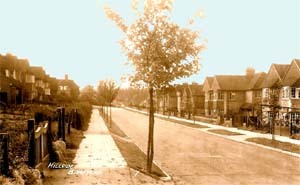 At the eastern end of the houses on Winkworth Road, No1 on the Northern side had a triangular garden coming to a point alongside the road. Running from there was a track along the back of the houses in Winkworth Road until No. 29 and then on to Sutton Lane . The other side of the track were woods. Just in the woods at the end of No. 1 s garden an open top steel water tank was built which formed a water reserve for the fire service. We used to throw stones into the water. were placed at intervals, attached to stakes. Any left over food, what little there was, would be tipped into these bins. These were collected at regular intervals and the contents turned into pig swill for feeding pigs. However one night my Father fell over some of these bins breaking some ribs and also damaging his teeth. We visited a few times the British Restaurant which was situated in the parade of shops at the Eastern end of Bnstead High Street and opposite the Police Station. They were set up by the Government to provide good substantial meals. For sixpence you had a soup, main meal, and a sweet. One afternoon at Nork Primary School, we were all given a package, containing chocolate powder. It was a present from the people of Canada. 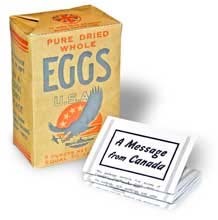 My Mother always seemed to have a supply of dried egg powder from Canada in the cupboard which never seemed too bad. One day at School we were all assembled in the main hall. Mrs Wiggans, one of our teachers, presented her son to us who had recently reached home by various routes, having escaped from the Prisoner of War Camp in Germany. He told us of his experiences although I cannot remember any of the detail. Quite often during the war and in summer my Mother would take us on picnics, sometimes on Banstead Downs, and sometimes we would catch a bus to the Walton on Heath, Colley Hill area. One such picnic to the Walton area we came across a massive dump of jerry cans, filled I assume with petrol, with many American Army personnel rushing around. On reflection I assume that that picnic must have been in May / June 1944 just prior to the D-Day landings. I m amazed we were allowed to get so close to such an area. One Saturday afternoon we all walked along Winkworth Road and then part way up Bolter s Lane. Approximately half way up on the right hand side there was a large playing field next to the Banstead House, the local Boy s Borstal. Along with many others we looked at a German bomber which had crashed in the playing field. Although it was well guarded we managed to get a very close look at the plane. When Autumn arrived we used to catch the bus to the Colley Hill area to gather blackberries, no doubt to add to our diet. We also harvested rose hips for syrup which were collected by the school.Sometimes when we were playing on the Downs we would see men walking around dressed in a bright blue uniform with white shirt and red tie. My mother said that they were wounded soldiers from the Military Hospital at Belmont. I remember that on the same evening a massive bonfire was made and burnt. It was located in the middle of the road where Follyfield Road and Commonfield Road meet. I have since found a photo, of my brother dressed up as a cowboy, and I was in a sailor uniform, taken on that day. Our area did not have a street party although the residents of Winkworth Road going up the hill from Commonfield Road had one a few days later. I also remember being taken to the cinema to see the Pathe News report on the Victory Parade through London which took place on the 10th August 1945. I do remember that I attended another massive bonfire in the same location as the VE DAY bonfire. However that s all I remember of that occasion. In the Autumn of 1945 we were able to take a short holiday in a Guest house in Bognor Regis. THE STORY OF PILOT OFFICER ANTONY HAYWARD. This is the story of my father, Anthony Hayward. Much of the description of the war events comes from a Flemish book. Wendy Henningsson a BHRG member assisted with the translation, and Mark Stanley another BHRG member, revised the text and incorporated additional research material. My brother Tim, my sister Judy and I (Liz) lived in Fiddicroft Avenue Banstead. We have many items from our father's exploits and all these have been collated into this story by Lewis Wood, the BHRG webmaster. 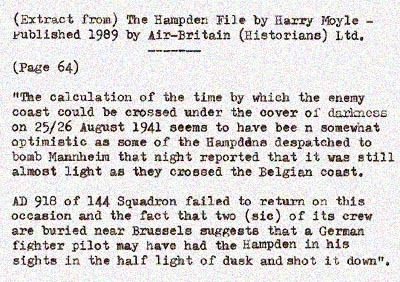 On the night of 25th-26th August 1941 a Handley Page Hampden Mk I AD918 of 144 Squadron (Squadron codes 'PL') crashed south of Brussels, believed shot down by anti-aircraft fire or 'flak'. The crew comprising of Sergeant Donald.A.Whiting (Pilot), Pilot Officer Anthony.E.Hayward (Observer, later called Navigator), Sergeant Gordon .C. 'Smithie' Smith (Radio Operator) and Sergeant J.Christie (Air Gunner) had taken off from RAF North Luffenham at 20.10hrs for a bombing raid on Mannheim. Don Whiting's brother later recalled that before the war, he and Don had taken a pleasure flight from Manston airfield in Kent and it may have been this that was the start of Don's interest in flying. In 1938, he joined the RAF volunteer reserve (RAFVR) and began his initial flying training from Fairoak airfield near Woking - a new and exiting 'hobby'. As a member of the RAFVR, and with war inevitable it wasn't long before he was called up and on 27th of June 1940 he was awarded his 'Wings' as a Sergeant bomber pilot and was posted to 144 Squadron at RAF North Luffenham on 15th of February 1941. In May Don was crewed with a new observer (later Navigator), P/O Antony Hayward and a radio operator Sergeant "Smithie" Smith, together with Air Gunner Sergeant J Christie. Among their first missions was a 'gardening' mission laying mines off Borkum in the Frisian Islands. Thereafter mainforce bombing raids followed on a regular basis on industrial targets in Hannover, Kiel, Bremerhaven and Osnabruck. On 25th May and 6th July attacks were made against German shipping in Brest using armour piercing bombs. 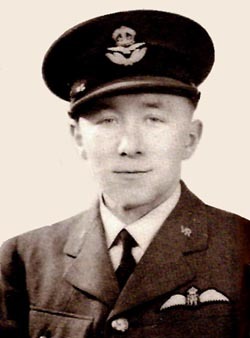 P/O Antony Hayward, wrote about his crew: "Don was a pilot who did not hesitate to fly in a straight line to his target even under heavy air attack. That allowed me as navigator and bomb aimer to successfully complete the mission in most cases . It goes therefore without saying that we were hit by "Flak" on several occasions. My memories of Don and Smithie are of two young guys, always well humoured, and Don was seldom seen without a bottle of milk, which he drank pints of. One action brought Don Whiting - albeit anonymously - onto the front pages of the newspapers. On a regular basis, bomber crews were used in daytime to conduct air/sea rescue searches for missing crews shot down over the sea. 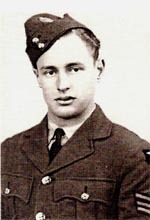 On the night of the 1st of July 1941, Sergeant Woolston 'ditched' his aircraft after a raid to Dusseldorf. Together with the other three crew members, they got into their dinghy and this became the beginning of an ordeal that would last nine days. First day: We were without compass and only had a few sweets, a can of food tablets, a small quantity of concentrated chocolate, as well as a litre of water and a small bottle of rum. A bomber flew over us and we tried to attract his attention but the flare pistol did not work. At night we were packed uncomfortably together with the radio operator at the top. We all had cramp and nobody could really sleep. Second day: Waves came into the dinghy and we had to remove water with a canvas bag. At night we took it in turn to keep watch every two hours. Third day: We reduced our ration of water to one soupspoon instead of two souppoons a day. Fourth day: We tried in vain to attract the attention of the British aeroplanes, waving scarves and handkerchiefs and flashing with a mirror. We started to talk about ridiculous things and said that once we were saved we would stand in a row with eight glasses of shandy, one in each hand and down them both together. Fifth day: We finished the sweets and tablets. We played a game to see who could hold his head the longest under water, until the navigator came out of the water with a scream. "There is a great big mine underneath us." We all had a look. There she was, covered with muscles. It was a big thing with pins. Shortly after this we saw three torpedo boats coming in our direction, but 1.5 km from us they turned away. Sixth day: We tried to paddle in the direction of the coast but gave up at 20.00hrs. Seventh day: Now we were also paddling at night, but we were losing our strength. I could not even stand up anymore. We had to blow up the dinghy more and more often with a-hand pump, but we were so weak and could therefore only pump twelve times. Eighth day: All the drinking water was used up, and our tongues starting to swell up and burst. We rinsed our mouths with sea water, but did not drink it. Ninth day: We spotted a Hampden and waved and aimed our mirrors at it. The pilot dropped his own dinghy and a water bottle and circled for four hours around us until we were saved by the "Air Sea Rescue". The pilot that finally located the four men was Don Whiting. The radio operator transmitted their position (forty km east of Great Yarmouth) and fired his "Very" light pistol signals to the arriving lifeboats. After landing, Don and his crew obtained a telegram with congratulations from 5 Group Bomber Command. Don had by now flown his twenty-fifth operation and on 22nd of July the crew enjoyed a rest from operations. During this period they did some test flights to evaluate a new bomb-sight manufactured by the American company, Sperry. On 25th of August 1941, after four weeks of rest, the crew flew its 28th and last mission to Mannheim in Germany where the Hampden was damaged by Flak. 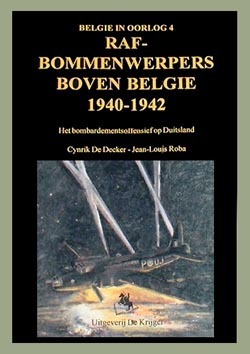 During their return, near to the city of Brussels, fire broke out and the Pilot ordered the crew to bail out. "I realised that we were very low when Don ordered us to leave the plane. I deployed my parachute immediately, without the usual 'Count to ten' routine, and even then it did not have time to open properly. I hit the ground very hard and as a result injured my leg, back and right arm. Christie and Smithie opened theirs too late and never stood a chance." At 23.00hrs the twin-engined bomber hit the ground near the Ninove-Halle road, near Puttenburg Castle, Pepingen (near the village of Brages, Brabant). "I could not walk without help, but two Belgians carried me to a house, I think near Evere, where a very nice lady put me to bed and fetched a doctor who tended a Flak injury to my head. The following morning the lady told me that the Germans were checking house after house. Because I could not be moved, she had to go and tell the soldiers where I was before they found me. I was moved to a hospital in Brussels and I will always remember the kindness of the Belgian Personnel. A nurse asked me if I wanted to write to my parents. I wrote a short letter that she hid in her apron. My father received the letter before he received the notification from the Air Ministry or the Red Cross. He carried it himself to the ministry because they did not want to believe that he was already briefed before they knew where I was. The other three crew members, Don Whiting, his radio operator Sergeant Gordon Smith and the Air Gunner Sergeant John Christie were buried at the cemetery of Evere-Brussels. 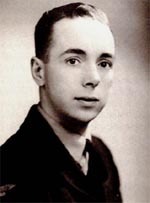 The twenty-two year old radio operator Gordon Smith, an office clerk with the London, Midland and Scottish Railway Company (LMS) was on his 23rd mission. The Air Gunner, John Christie was a new crew member, probably a 'spare gunner' on the squadron and it is believed that this was his first operation. The injured Hayward was taken prisoner of war and was cared for at the "Hopital francais" at St.Agatha-Berchem. 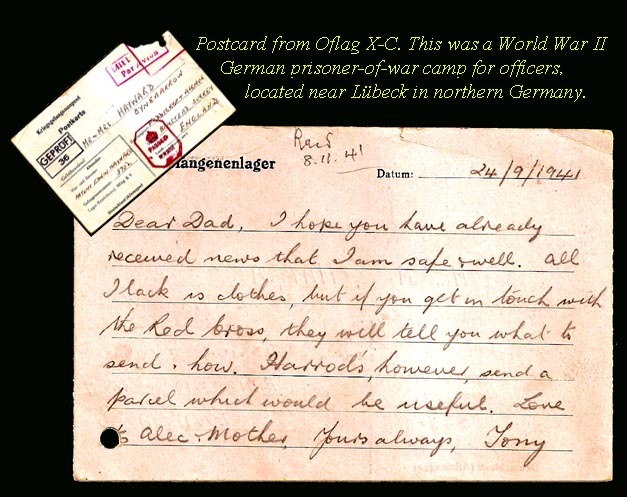 He was later interned in Camps Oflag X C /L3 as PoW No.3752. 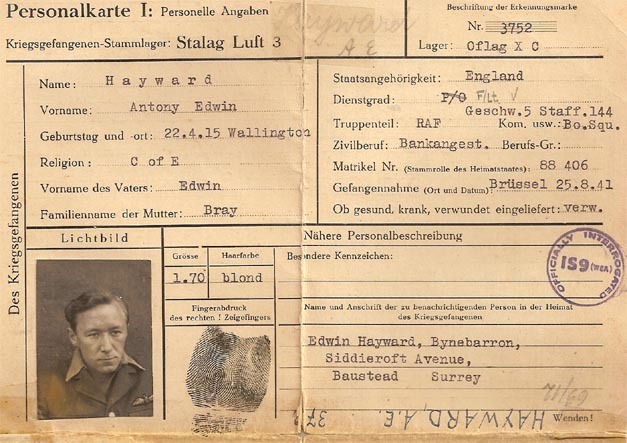 Antony Hayward Stalag Luft 3 identity documentation. Antony sent this postcard home to his parents in Banstead. He mentions his twin brother Alec who was lost at sea in 1944 when his Halifax Mark 2 on an anti-submarine patrol in the Biscay area, never returned. He is one of the 118 men remembered on the Banstead War Memorial. To see his story on this website click here . Antony found himself in The Cooler twice and these occasions were very efficiently recorded by his captors. Some 60 years after he was shot down Antony revisited the location and once again met Mme. Pelsteen the young woman who in 1941 took him in and probably saved his life. Over the years Mme. Pelsteen had become a recluse and had spent most of her life in the same house. It took some persuading to get her to come outside and meet Antony. 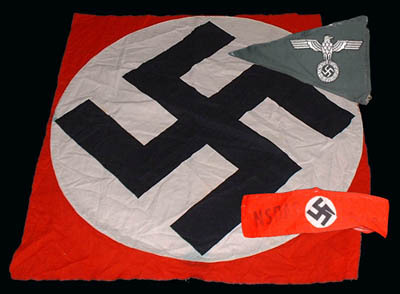 Following his release Antony collected various souvenirs on his way back. 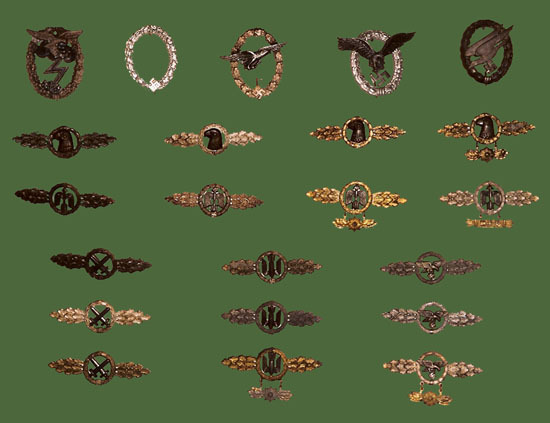 He somehow found himself in a factory that manufactured the German winged clasps and helped himself to a fine collection. German winged clasps acquired by Pilot Officer Antony Hayward. This collection has been donated to the RAFA in North Wales. For identification please visit ww2wings.com . 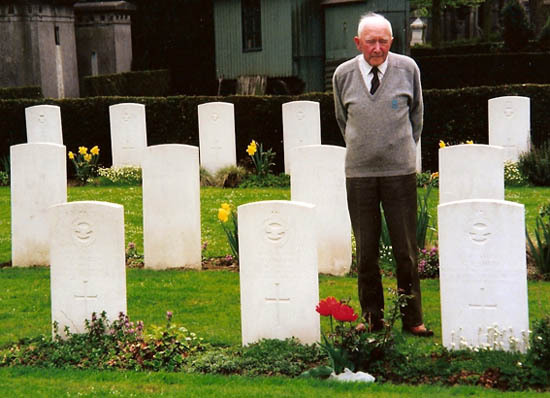 Antony Hayward revisiting the graves of the other crew members Whiting, Christie and Smith. After the war the Whiting family received a strange memento. A British veteran presented them with a piece of silk that came from Don's parachute. On it was written Don Whiting's name, recording that he "fell on 25:8:1941 at 23.00hrs at Brages". I was born in Epsom General Hospital in November 1936. 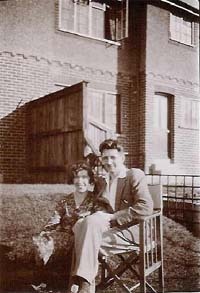 My parents, Tom and Elsie Slaughter had moved to Tattenham Way from Manor Park, East Ham in 1934. 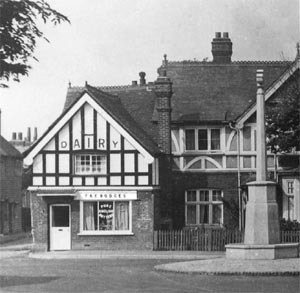 My father was employed as the Manager of Rhodes Newsagents and Post Office in The Parade, Tattenham Way. When I was born they moved to St Leonards Road, Tattenham Corner. My father left Rhodes and joined Hodges Dairy in Banstead Village and became a milkman until he was called-up for the RAF in 1941. It was in St Leonards Road and the surrounding area that I spent my childhood and youth. The Summer of 1944 was for everybody, young and old, a time of optimism. D-Day the 6th of June had seen the Normandy Landings with the Allies gaining a foothold in France. As a 7 year old, living at Tattenham Corner, the end of The War was in sight. My parents, and all the parents of the children in general, had never let us believe we could lose The War even in the darkest days of 1940, 1941 and 1942. So the VI Flying Bombs unleashed on South East England by the Germans on the 13th of June just a week after D-Day was to be a shock and, briefly, it dented our optimism. The VIs quickly became known as 'Doodlebugs' or 'Buzzbombs'. Their main characteristic was a drone or buzz as they flew overhead and then the engine 'cut out', followed by their gliding down to earth and exploding. When this occurred in populated areas it could be devastating with heavy loss of life. It was a random attack strategy with these deadly weapons of war landing anywhere on their flight path over the South East of England although clearly London was the prime target. I remember vividly during that first week of the VI attacks going to school by bus, the 164A, from the bottom of Merland Rise and getting off at the end of Tattenham Way. The Air Raid Siren echoed out its now familiar warning from outside Roberts Stores at Burgh Heath. My memory has always been it was a Friday which, if correct, was Friday the 16th of June. I was attending the Burgh Heath Methodist Junior School which at that time was housed on the Ground Floor of the Banstead Central Girls' School in Picquets Way. The reason for this was that the Methodist School had no Air Raid shelters of its own, as required by statutory regulation, so the school spent The War at Picquets Way where there were shelters. As we left the bus with the siren wailing the adults hurried us up into Picquets Way, across the School Playing Fields towards the school shelters. Our teachers were shouting at us to hurry as at least one 'Doodlebug' flew quite quickly above us. It was frightening because this was a new form of attack on the population. It came during the daytime and people were unsure, initially, how to deal with it. Once inside the shelters we felt immediately safe and soon calmed down .As the days passed we all quickly understood the pattern of 'Doodlebug' attacks. All the time the engine was going we were safe. If the engine cut-out then we had to find cover. The duration from the engine stopping to it hitting the ground varied from a few seconds to what seemed like a minute of two. Just over three weeks later, on Monday the 3rd July, my mother and I called into my aunt's house in Picquets Way before setting out with my aunt, Winifred Mash and cousin Valentine aged 4 to walk to Banstead village. We turned into The Drive on our way to the Brighton Road. As we approached the Brighton Road, by the National Fire Service Station on the corner opposite Garratts Lane, the Air Raid Warning sounded and the dreaded drone of a VI overhead could be heard. At that moment several firemen rushed out of the Fire Station and speedily gathered us up and without formality pushed us into a slit trench at the side of the buildings just as the VI's engine stopped. We all knew what was coming as the Flying Bomb glided down. The firemen told us to lay in the bottom of the trench and without any thought for their own safety they laid over the top of us. The only protection they had was from their steel helmets - no flak jackets or body armour in those days. Within a few seconds, it seemed an eternity at the time, there was a loud explosion. When it was considered safe the firemen stood up and helped us to our feet. We all looked towards Nork where the explosion had come from to see a pall of brown and black smoke rising vertically, no wind to speak of. The VI had come down in the vicinity of the junction of Nork Way and Eastgate. It caused major damage to the garage, shops and buildings. 5 of the 11 casualties were taken to hospital, one of whom later died. The 'All Clear' sounded and we continued our journey to Banstead. We were a little shaken but nothing more. With mounting casualties and some considerable terror within the populace the Government hurriedly organised a new wave of evacuation of children away from the South East. Some went in 'school parties' others went separately as children traveling with their mothers or other close relatives. As my father was away in the RAF my mother decided to be evacuated with me and my young cousin Valentine Mash from Picquets Way during the 2nd week of July as I remember. We made our way, early one morning, to London's Euston Station by train from Sutton Station, having no idea where at the end of the day we would finish up. One very real and worrying memory of that journey into the 'unknown' was being crowded with literally thousands of other children and mothers standing in front of Euston Station. Although I was only 7 at the time I had visions of a Doodlebug landing amongst us. Thankfully no air raid sirens sounded. Some how we all made it into Euston Station where we boarded one of the many waiting trains. Our packed train left Euston around noon . What ever way you look at it was a fantastic exercise in organization, nobody was seemingly left behind. Traveling in carriages pulled by a steam train was exciting and soon the fears we had experienced in the previous weeks evaporated. I have no idea where the food and drink came from but we survived the journey to North Wales arriving at Denbigh Station some 4 or 5 hours later rather tired that's all. We and all the other evacuees were to spend a memorable Summer in rural North Wales. For us it was the village of Betws-yn-Rhos some 4 miles from Colwyn Bay. I even spent the last week of the Summer Term at a Welsh speaking school. I saw the sea for the first time at Rhyl. The people of North Wales were very kind to us added to which it was a very sunny July and August. By September when the threat of the VI attacks had receded my mother, cousin and I returned home as did many other evacuees. The next wave of German attacks was the VII Rockets however, though they were more dangerous than the VIs, they were targeted on Central London. Other than the odd stray VII we were spared but anyway there was no obvious warning of their coming. The VIIs, as the Allies advanced further into Europe, soon died out. Within a year The War was over. 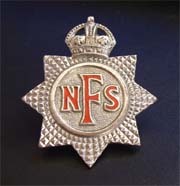 My abiding memory of that Summer of 1944, at a time when many momentous events were occurring in the Second World War, was the selfless bravery of those firemen of the Banstead National Fire Service stationed at their Brighton Road Station on the 3rd July 1944. I often wonder who they were? Memories sent in by Michael Woodman as recalled in July 2006. 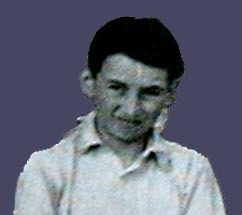 My name is Michael Woodman; I was born in January 1936 and lived at No 8 Hillside during the War years. My parents were Queenie and Harold Woodman who moved to the house in 1930 when they married from where they had lived near Woodmansterne station off the Chipstead Valley Road in Coulsdon. Having recently read through ' Memories of Wartime Banstead District' I offer the following memories that may be of interest. My Uncle, George Ratcliffe, lived at No 18 Hillside that was the extended semi joined to No 16 where a High Explsive (HE) bomb fell in 1940. 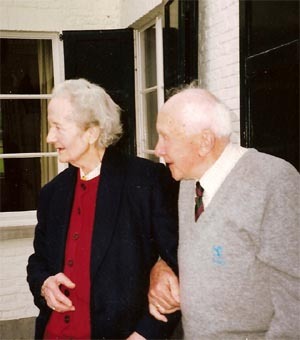 His mother and father, Effie and James Ratcliffe, lived in the extended portion of the house and he, his wife Dorothy, and their three children, Audrey, Alan and Joan, lived in the main part. The bomb damaged No 16 extensively as it must have just missed the back corner of the house penetrating the soft chalk to a depth that caused the blast to rise vertically thus reducing the lateral damage considerably. I well remember the crater that was left, a deep hole surrounded by a mountain of white chalk. The unstable building was demolished and the end wall of No 18 shored up. The roof of No 18 caused a number of problems after the war from where it had been lifted and dropped by the blast. My father arranged for my mother, brother Geoffrey and me to stay at a boarding house in Brendon, North Devon for six months during 1940 when the bombing near London was at a peak. We returned later that year to live for a while in Waterer Gardens, Burgh Heath as the house in Hillside had been leased out for the period of a year. This is a picture of it taken in 1930 just after it was built; it cost £800 to purchase. When we finally got back to Hillside the bombing had eased slightly but the hostile aircraft continued to pass close by and the anti aircraft guns that appeared to be mobile, boomed whenever the siren wailed. Looking from the back door of the house on a cold winters evening it was possible to see the dreadful glare that indicated that London had caught another packet. This was when father thought if safe to do so but if the aircraft were too close I was bundled into the back of the broom cupboard under the stairs where a cushion made a little nest for me to sleep in. We seemed to get the tail end of the raids and the bombs that dropped appeared to be erratic but we were near to the goods yards at Banstead Station that could well have been a worthwhile target. One morning I was curled up on the cushion when a bomb exploded nearby. Coming out from the cupboard the air was filled with dust, the sun was shining through a gap where the metal French doors in the sitting room had been blown open and broken glass littered the floor. Later it was discovered that a bedroom ceiling had suffered, there was an area about a yard across that was hanging in jagged pieces round the edges and a mess on the bed where the lath and plaster had fallen. I think that this must have been the bomb that fell in Nork Way. When the friendly aircraft crashed in the garden of a house in Tudor Close I made my way to the top of the hill to see if I could see anything. I was confronted with a large trailer that had been rushed to the scene with a crew to clear up the debris. Later in my life I became friendly with the son of the owner of 'Broad View' who was Best Man at my wedding in 1959. He told me the story of the crash and I think that I am right in saying that the engine stayed in the ground for some years as the force of the impact buried it well below the surface and for some years they had to be careful with what they put on bonfires as there were a number of bullets liberally spread around the garden. The body of the pilot was recovered and put on the veranda before being taken away. A strong military presence was evident for some time. Mr George Harrison owned the property. He also owned G.W. Harrison (Builders) Limited of Canon Lane Burgh Heath. Ian Harrison, the son, moved to Rustington when his parents died and the business was sold. I lost contact with him in the 1980's. It is interesting to note that Waterer Gardens mention previously, was developed by G.W. Harrison Ltd. The 'W' being a family name 'Waterer'. The friendly Lightning aircraft that crashed on Banstead Downs came into my view over our house in Hillside and was obviously having problems. When it crashed I rushed to the area on my bicycle and was most probably one of the first to arrive on the scene. The burning wreckage with the strong smell of disaster was a ghastly scene as were the bits of body that hung from the surrounding Hawthorn and scrub. The emergency services soon arrived and cordoned the area off. I remember that the roofs of the houses in Burdon Lane were evident and that it was a hot day. On a number of occasions I did my bit to help the Home Guard and Air Raid Wardens. I made a box that contained sections for clout nails and wire nails; I armed myself with a hammer and saw from fathers workshop and collected pieces of roofing felt and laths from the ARP post in Buckles way. I then proceeded to look for windows that had been broken by the blast and did my best to patch them up. One house had a back door with two long vertical windows panes of which needed attention. I cut the felt to size and fixed it with suitable laths hammering the last nail home. This operation had obviously had some effect on the good pane as it shattered and I had a further job to do. I was most probably eight years old at the time. The Morrison shelter was an improvement in our house. Father erected it in the dining room and this provided a steel cage for us to sleep in at night and to take refuge during a daytime raid. One morning I woke with a feeling of claustrophobia that was caused by my mother spread-eagled over me as I lay sleeping near the side of the shelter. The raiders had come quickly and she had not had time to fasten the wire mesh on the side therefore was using her body as a shield. A bomb fell close by in Buckles way; I later took time to investigate the damage that seemed to be superficial, the bomb having fallen on a piece of waste ground. As a family we often walked to St Mary's Church Burgh Heath on Sundays. Most times it was possible to collect pieces of shrapnel and foil that I believe was used to hamper enemy direction finding equipment but on one occasion we were on the look out for Butterfly Bombs that were dropped in numbers and were designed to be picked up by unsuspecting civilians. They had fuses that were delayed until picked up when they would explode with dire consequences. We didn't find any but the warning notices certainly had kept us on guard. The blast wall that was erected outside the vestry door of St. Mary's Burgh Heath was knocked down when the war was over. My father purchased the rubble and had it shipped to 8 Hillside where he systematically chipped the concrete from the bricks in order to build a coalbunker outside the larder window. The flying strong concrete damaged two pairs of his prescription glasses but he was pleased to have recycled the material and to have added to the church funds as well. My mother was ecstatic when father gave her a gas mask for a birthday present. He also pleased her with two defused incendiary bombs that he kept in the dining room. They were instruction pieces that he used when recruiting for the fire-watching job that he did at his works in East Croydon - Creed and Co Ltd. Looking north from our backdoor it was possible to see well into the London area on a clear day and the sight of the barrage balloons lingers in my mind, as did the fires when London was burning. The Doodle Bugs were often seen in the night sky with their telltale flame gushing like a retreating dragon. Father had realised that when the flame was extinguished the bomb would fall like a stone therefore if this happened anywhere near us whilst watching from the back door, a hasty retreat was made to the shelter until a 'crump' of varying magnitude would tell of the proximity of the explosion. A number fell close causing substantial damage to property but luckily few lives were lost.